Tryouts | Teaneck Junior Soccer League, Inc.
Teaneck Junior Soccer League (TJSL) is a nonprofit, all-volunteer organization to promote soccer in Teaneck. Over 1,000 children play every year. All players must pre-register for the tryout and wear soccer shin guards covered by long soccer socks and either soccer cleats or sneakers. The Director of Coaching and/or a professional trainer will lead evaluations duringtryouts. The evaluations are the basis, but are not the only criteria, for the selection of players and placement on teams. Some players may be required to attend a callback session. What's the difference between FC TEANECK and REC Soccer? 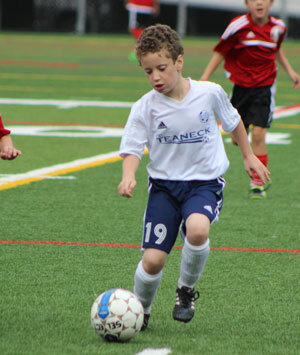 FC TEANECK is a competitive travel soccer program that plays year-round. Teams train twice a week during fall and spring and once a week in winter. Games are against teams across North Jersey. Professional trainers are assigned to each team and work with players every week. Training sessions are held on Monday through Thursday evenings with the younger teams earlier in the evening and older teams later. Games are held on Saturday nights after sundown and Sundays although some make-up games are played mid-week. Do current FC TEANECK players attend tryouts? No, The tryouts are for players not currently on a FC TEANECK roster. If selected, when do the players begin playing? Teams begin training in August with games starting in September. What are the fees associated with FC TEANECK? Fees for the 2018-2019 season have not been set. However, the current fees for registration and uniforms can be found at FC TEANECK Fees and FC TEANECK Uniforms. Please direct all inquires about the FC TEANECK program to . FC TEANECK tryouts are scheduled throughout the year for new teams and teams looking for additional players. The Director of Coaching and/or a professional trainer will lead evaluations during tryouts. The evaluations are the basis, but are not the only criteria, for the selection of players and placement on teams. Contact if you wish to tryout for a team.